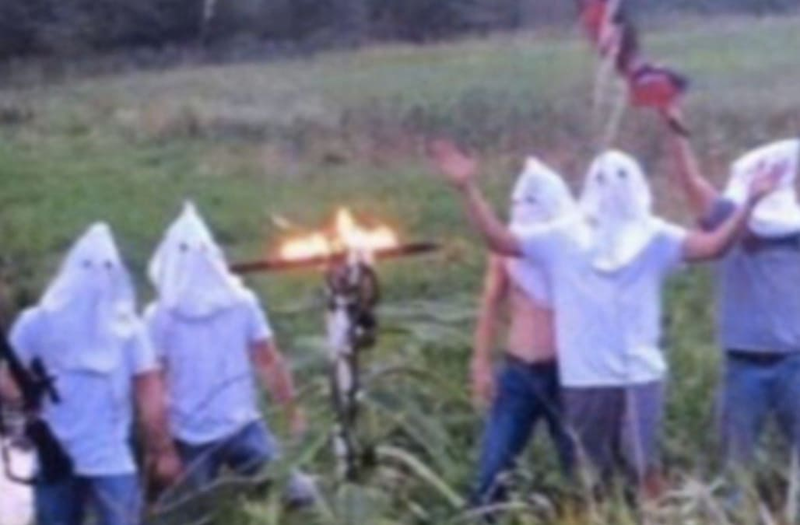 Five high school students wearing Ku Klux Klan hoods have been disciplined after a photo of them posing in front of a burning cross emerged on social media. One of the students is armed with a rifle, while another is holding up what may be a Confederate flag in a photo that was circulated on Twitter and Facebook. Principal Bill Messerole of the Creston Iowa Community High School confirmed all five students are students and said they were promptly disciplined after the school learned of the photo on Wednesday morning. Messerole declined to elaborate on how the students were disciplined, citing the school’s confidentiality policy. (Original Caption) Long Island, NY-Ku Klux Klan with hands raised in oath during night meeting. (Original Caption) 1/4/1923-Homestead, FL: Photo shows gathering of the Ku Klux Klan, members of the invisible empire, at Homestead, FL., thirty miles South of Miami, and within three miles of the Southern most point of the mainland of the United States. The Imperial Wizard of he Klan is somewhere in the group. But, he just won't make himself known. Ku Klux Klan members hold a march in Washington, DC, on August 9, 1925. (Original Caption) Over 100,000 people are expected in Washington for the Klan parade and gathering. Government buildings are all guarded in case of disorder. Photo shows members of the Women's K.K.K. of Virginia marching down Pennsylvania Ave. The Imperial Wizard of the National Knights of the Ku Klux Klan, Don Black, wearing a suit and tie, with white-gowned Klan members in the background. Demostrators take part in a protest against asylum seekers brought to stay at a former army barracks in the Hennala district in Lahti late September 24, 2015. Demonstrators threw stones and launched fireworks at a bus full of asylum seekers arriving at a reception centre in Lahti in southern Finland, late on Thursday, Finnish media reported on Friday. Between 30 and 40 demonstrators, one in a white robe like those worn by the white supremacist Ku Klux Klan in the United States, waved the Finnish flag and shouted abuse at the bus. Picture taken September 24, 2015. REUTERS/Heikki Ahonen/Lehtikuva ATTENTION EDITORS - THIS IMAGE WAS PROVIDED BY A THIRD PARTY. FOR EDITORIAL USE ONLY. NOT FOR SALE FOR MARKETING OR ADVERTISING CAMPAIGNS. THIS PICTURE IS DISTRIBUTED EXACTLY AS RECEIVED BY REUTERS, AS A SERVICE TO CLIENTS. NO THIRD PARTY SALES. NOT FOR USE BY REUTERS THIRD PARTY DISTRIBUTORS. FINLAND OUT. NO COMMERCIAL OR EDITORIAL SALES IN FINLAND. Creston Police Chief Paul Ver Meer said the school was handling the incident internally, and that they were not involved in an investigation.